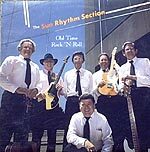 CD review: "Old Time Rock 'n Roll"
Interest in Sam Phillips' old Sun label is reaching new highs. RCA recently re-released Elvis Presley's Sun material, Charly Records in England has released the rest of the Sun catalog in various compilations, and a few years ago Johnny Cash, Roy Orbison, Carl Perkins and Jerry Lee Lewis united in Phillips' Memphis studio for a rockabilly reunion album, "Class of '55," to commemorate their beginnings at Sun. Now, some of the best backing musicians from Phillips' glory days have put together a band of their own, the Sun Rhythm Section. Guitarist/vocalist Sonny Burgess and original Johnny Burnette Trio member Paul Burlison, pianist Jerry Lee "Smoochy" Smith, bassists Stan Kessler and Marcus Van Story, and Elvis' old drummer, D.J. Fontana fire their way through a selection of some of the finest rockabilly laid down in some time. Spirited renditions of "Red Hot," "That's Alright, Mama," "You're a Heartbreaker," Love My Baby" and "Tutti Frutti" over convincing evidence that the best interpretors of rockabilly are the men who first laid it down some 30 years ago.